Dependent values. y must contain at least two points. Independent values. x must be the same size as y. The elements of x must be in ascending order. Smoothness for each interval between two contiguous data points. The larger the smoothness, the smoother the curve. The number of elements in smoothness n - 1, where n is the length of y. If smoothness is unwired, this node sets all elements of smoothness to 1. Balance between the smoothness of the cubic spline fit and the accuracy with which it fits the observations. balance parameter must fall within the range [0, 1]. If balance parameter is 0, the cubic spline fit is equivalent to a linear fit. If balance parameter is 1, the cubic spline fit interpolates between the data points. If balance parameter is out of the range [0, 1], this node calculates an appropriate value for balance parameter automatically according to the values of x. 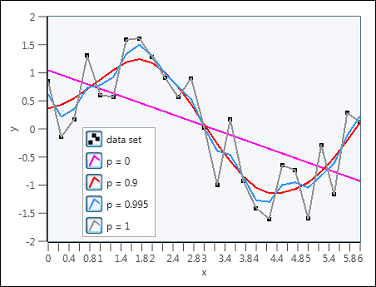 The following graph shows the fit results when balance parameter takes different values, where p is balance parameter.